I swore I wasn’t going to do this, but an idea has been in my mind for months about a quilt I want to make. Over the past few days, I’ve tried to resist but the siren call of that project proved too much. So what did I do? First I sat down and figured out exactly how many of each shape I’m going to need to print on my fabrics. Then I cut freezer paper to size. Lots of freezer paper cut to size. All labelled and ready. So sometime over the next two days I will press the freezer paper to fabric, cut the fabric, feed it through the printer and then cut the perfectly printed shapes, sort them into blocks and put them in little envelopes. And once that’s all done, this will be a new project in a box. And one I’m really excited about. And one that demands a new project box. I think the dollar store will be a destination today looking for a special project box. Normally I don’t cut all the freezer paper for a project, but use and re-use the same pieces of freezer paper over and over. This time I was on a roll and just decided to cut exactly the number of freezer paper sheets I needed. They won’t go to waste as I find I use similar sizes over and over and can always cut down ones that are a bit larger than I need for something else. This will also make it easy to just take an hour or so to feed the freezer paper/fabric through the printer and have everything I need for the project in no time. Time to fess up. Over the past two days not a lot of stitching has gone on as I have had two MRIs – one Tuesday night and one last night. The MRIs in themselves are not a big deal. The problem is I’m claustrophobic. Very claustrophobic. Even with a sedative, I find the time in the dratted noisy tube hard to handle. Last night’s was way too much for me. I was finding it hard to even breathe. I got through it though and now have my fingers crossed that I won’t need another one for quite some time. Now that those are over, I know I’ll be back to playing with fabric. 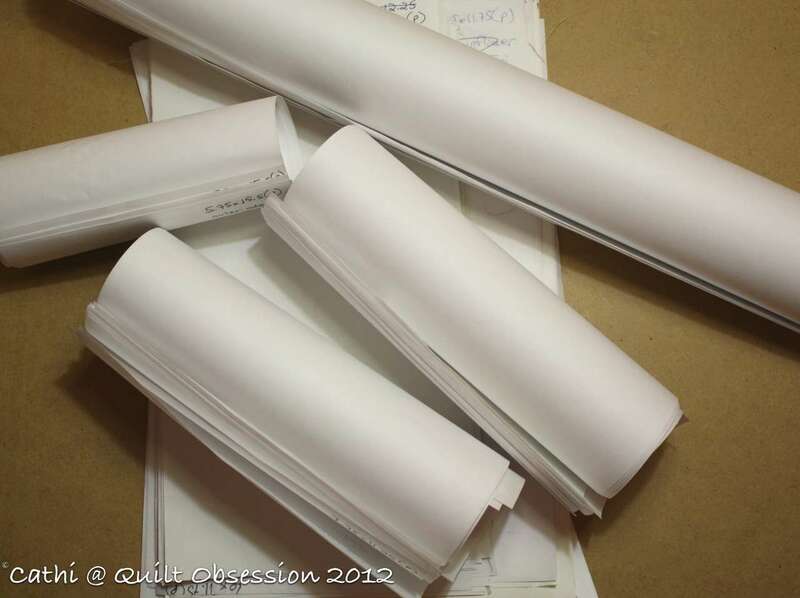 But, in a way, they served a good purpose as I spent the time that I was a bit too jittery to stitch cutting freezer paper and planning the new project. There’s always a silver lining to a cloud and that was the silver lining to the dratted MRI machine cloud. Happy Thanksgiving to my American friends! I hope you have a wonderful day with lots of great food and company. 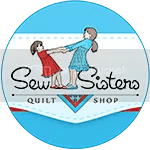 Today on Blogathon Canada, the host blogs are Live, Laugh, Love … Sew from Manitoba and Church Avenue Quilts from Quebec. More great prizes are involved and more new blogs are there to be discovered. 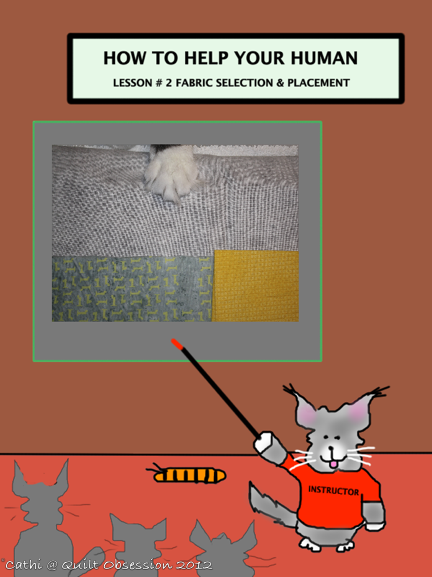 Baxter was giving lesson 2 in the “How to Help Your Human” class. And we think he was examining the little spool/klosjes blocks while he gathered information for the next lesson. Baxter never fails to make me smile! Fingers crossed that you won’t need another MRI for a very very long time. 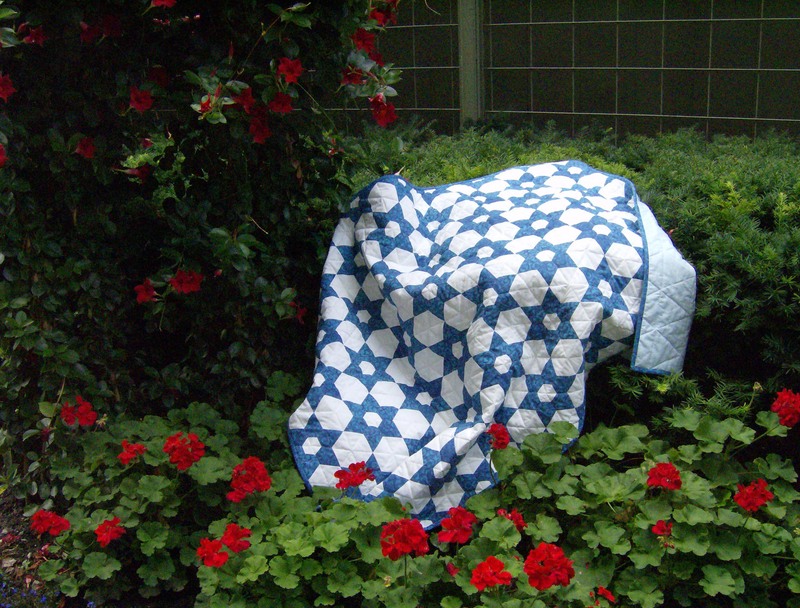 new mystery quilt…we can’t wait to see what you have up your sleeve! Hugs…Happy Thanksgiving (from afar)…Happy stitching! what new project are you going to be working? and I hope you do not have a major medical problem – I had an mri once and didn’t bother me but I know some people do have severe problems with them. I want to get started on the fancy dresden plates soon. Hoping that they figure it out from those MRI’s, and you don’t need any more. I’m pretty claustrophic, as well……and have never had an MRI. I can’t imagine how awful that must have been! Getting ready to put the bird in! Have a great day! Hi Cathy, sorry to hear of not one but two MRI’s. Wah!!!!! I recently had one for my back and the hardest thing was not being able to move. Loving the baxtertoon. They make me smile and Cappy is always in the picture. At my house that would be equivalent to the loo loo. Don’t know how we came up with that name lol. Sorry about your MRI experience. Too bad they don’t have an open MRI alvailable for you! I personally have had 2 MRI’s and loved it! Weird me, I guess! I can’t wait to see what you’re cooking up with that mystery project!! 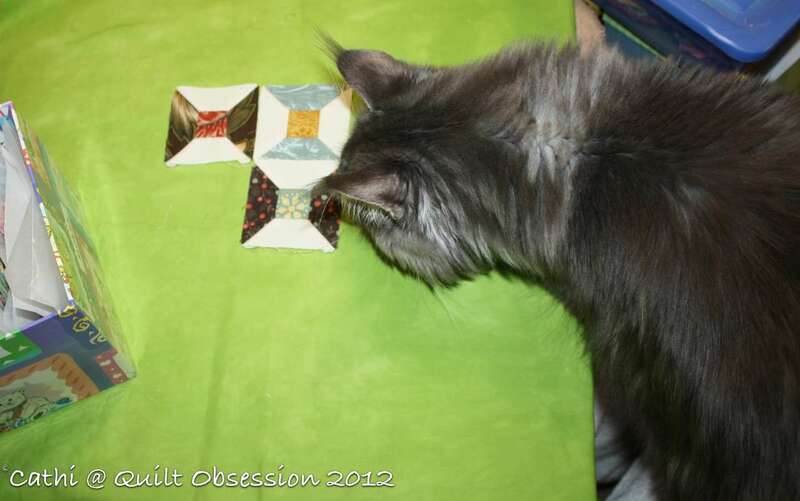 Oh, a mystery quilt, what fun! Hope the mri’s aren’t going to be a regular thing, sounds dreadful for you. 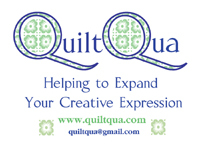 Have a happy day quilting. Cathi! I’m so sorry you had to go through not just one, but 2 mri’s. I’m not claustrophobic, but I have a good friend who is, so I can sympathize. I think it’s funny that you’re starting another PIB! Do you work on a different one every day? A little confession-I was supposed to go to a workshop at my guild for the Hunter’s Star, but I decided I’d rather do the Inklingo version. Slowly but surely, you’re converting me! I love the ‘how to help your human’ cartoons. I’m sure all cat owners really relate to that! I’m claustrophobic too and I told the tech to keep talking to me so she would tell me how long each little segment was going to take and I was able to get throught it without freaking out. I’m not looking forward to any in the future though either. I hope you don’t need any more scans for a very long time! I’m looking forward to seeing your new PiB…and the box! With the MRIs, I think that sounds like a perfect excuse to cave and start a new project. Fingers crossed the results are what you want. Love the baxtertoon and pic. My boy is sitting beside me “helping” right now. Sorry you had to endure the 2 MRI’s great you can find a silver lining. I can’t wait to see the project you will be working on. Love the thoughts in that little Baxter head. Glad you mustered the gusto to get through the MRIs. Those things are such buggers. Hope the results bring you good news. Aren’t you the tease?! WHAT new project? Curious minds wanna know. lol. Love Baxter. Please tell him that Missy and I say ‘hello’. what’s the new project? details please!